Around 1880, two or three individuals were known to have made primitive chairs in their barnyards out of hickory poles in the Monrovia and Morgantown, Indiana area. Following that humble beginning, a group of people in the Martinsville, IN, area banded together in 1892 in an abandoned church, producing hickory sapling furniture as a full-time business. They chose “Old Hickory” as the company name, the same nickname as the late President Jackson. They incorporated in 1898, and began furnishing nearly all of the new national park lodges, including the Old Faithful Inn at Yellowstone National Park. The dining chairs in the main hall are the very same chairs shipped and installed in 1906. Notable individuals who have enjoyed Old Hickory furniture include President William H. Taft, Greta Garbo and Mrs. Henry Ford. Our May 16 auction includes a large selection of current Old Hickory furniture, still made in the same style, with sapling hickory logs, now in Shelbyville, IN. Offered in the sale will be chairs and a sofa from the Grove Park series, inspired by original designs in the Grove Park Inn, a four-star, historic American inn near Asheville, NC, which began around the turn of the last century. The inn’s decor was an arts and crafts theme, incorporating designs by Roycroft, mica and copper lighting, and rows of Old Hickory rocking chairs on the 500-foot outdoor terrace. 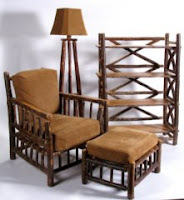 As a matter of fact, arts and crafts designer Charles Limbert, of Grand Rapids, MI, was an agent for Old Hickory furniture circa 1895-1905, further instilling the furniture’s place as complimentary to the arts and crafts designs of the period. The company was owned and operated by the Patton family of Indianapolis from 1908 until the closing of the doors in 1978. In 1982, the company was re-formed in Shelbyville, IN, and then sold in 1989 to the current ownership. Notable orders of Old Hickory furniture include 5,000 oak chairs sold to Indiana University in 1969 for their libray, a $1M order for Walt Disney World in 1989, and in 1994, Old Hickory furnished the first Rain Forest Cafe at the Mall of America in Minnesota. Old Hickory has also provided furnishings and fixtures for subsequent Rain Forest Cafe locations. In 1999, recognizing the significance of hickory furniture to the culture of Indiana, the Indiana State Museum hosted the exhibit RUSTIC TRADITIONS: INDIANA HICKORY FURNITURE. Old Hickory donated many different furniture settings to the museum. Whether in a rustic lakeside retreat, a back-woods hunting lodge or as a compliment to an arts and crafts decor in an early 20th century craftsman bungalow, Old Hickory Furniture has stood the test of time due to the style, quality and workmanship present in each piece produced. This auction offers a rare opportunity to purchase a symbol of Indiana heritage on the secondary market. View the Old Hickory in the May auction by clicking here.